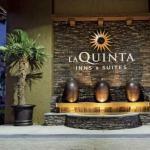 A free airport shuttle free continental breakfast and free Wi-Fi plus comfortable accommodations make the non-smoking La Quinta Inn San Jose Airport the ideal landing pad for busy travelers flying to and from the Silicon Valley. This low-rise property provides free Wi-Fi cable TV and mini-fridges in all 145 non-smoking rooms. as well as a spacious outdoor pool. Guests can work out in the gym or handle work matters in the hotel's business center which includes copy services. Parking during your stay is free and the hotel offers Park and Fly long-term parking for an additional fee. Guest laundry and valet dry-cleaning services are available. Located in the heart of the Silicon Valley right off of Highway 101 La Quinta Inn is three miles from San Jose International Airport and about two miles from Sun Microsystems and Intel Corporation. Downtown San Jose is within four miles. Two-and-a-half miles south is Santa Clara University and a Caltrain stop that whisks guests to San Francisco and the rest of the Silicon Valley. Dogs of all sizes are allowed for no additional pet fee; there is a pet policy to sign at check-in.